Arata decided he wants to move and live in Japan. 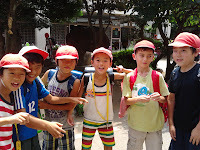 Arata wants to go back to Japan at next school holiday. Or he even wants to go back again during the rest of the summer holiday. What shall I do? ?